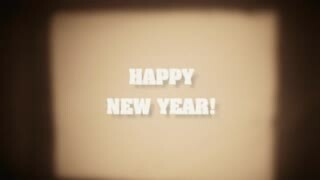 8mm Forum: H A P P Y N E W Y E A R ! » 8mm Forum » General Yak » H A P P Y N E W Y E A R ! Author Topic: H A P P Y N E W Y E A R ! May 2019 bring only the best to all of us and...many films. Bonne année et bonne santé (Good year and good health) ! And a Happy New Year to you Dom and all Forum members. lets hope for a good one and that we get lots of 8mm and 16mm films and equipment to buy. All thee best to each and everyone of you!!!!! I hope everyone has a good and happy new year! And many more! So keep on collecting. Best wishes for a happy and healthy new year to everyone! Greetings Live from The Hofbräuhaus in München! Happy New Year everyone and hope 2019 is a good one. The last few years, my now regular New Year's eve movie has been this one, a quick screen shot from last night. A great movie Graham. I know if I was on a ship I would want Leslie Nielsen as the Captain! Always liked him in his serious roles, less so his goofy comedies. Happy New Year to everybody in this Fórum. A HAPPY and HEALTHY NEW YEAR TO ALL FORUM MEMBERS!!! Peace and love to you and yours from us here. ...I watched The Towering Inferno on Blu-ray This New Year Eve.. Great to see Steve steel the show amongst all those heavyweights! Newman comes in second. Nice to see these pictures from our past in a new media form, forever preserved I hope.